We produce high-voltage transformers for power supplies and checking equipment from 10 to 300kV to order to meets customers' specific requirements. 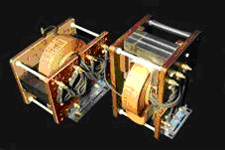 The HT series offers single-phase transformers while the HTD series offers three-phase transformers. We produce high-voltage isolating transformers in order to supply power to units on high voltage potential. These units connect the primary windings to the mains power and put the secondary windings at a high potential. The IT series offers single-phase transformers while the ITD series offers three-phase transformers.